this is the bag I use. 5 gal. paint strainer from Lowes. One of the benefits of soaking your barley in a mesh bag (Brew in a Bag), as opposed to some sort of two (or three) vessel system, is that you never have to worry about a “stuck sparge,” which is what happens when a traditional all-grain system gets clogged during the process where grains are separated from the liquid (lauter, sparge). 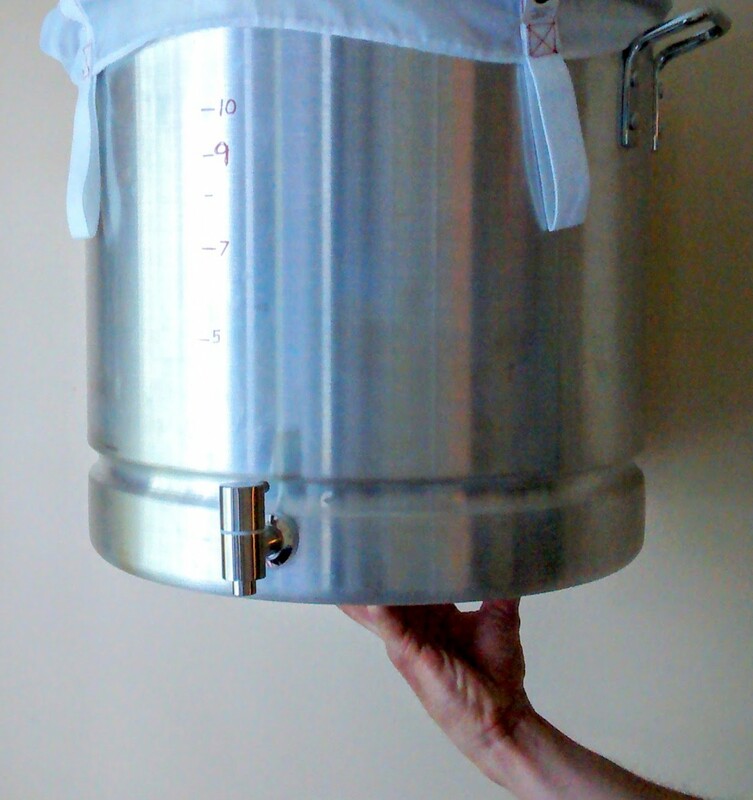 In BIAB, I simply lift the bag out of the pot: done. Sparging is optional. Now, stuck sparging probably rarely happens – and there are ways to prevent it, like using rice hulls – but sometimes it does happen. I know because people have told me. For beginning brewers: you’ve been warned. I’m not saying my way is better. Wait a minute, yes I am! Of course I think my way is better. Otherwise I wouldn’t do it. It all depends on what we mean by ‘better.’ Traditional all-grain brewers would say stuck sparging rarely happens, is preventable, and worth the risk of producing the best quality of beer possible. I agree with that. I do not claim to produce the best possible quality beer with my system. I simply point out the huge practical costs involved in doing that. And now I’ve added one more minor practical concern: stuck sparge and buying rice hulls for some batches.